We have to pay ‘Entertainment Tax’ for watching a movie. We have to pay Value Added Tax (VAT) on purchasing goods & services. And there are Excise duties, Import Duties, Luxury Tax, Central Sales Tax, Service Tax….hhmmm.. In this post, let us understand – what is Goods and Services Tax and its importance. What are the benefits of GST Bill to Corporates, common man and end consumer? What are the advantages, disadvantages and challenges? It has been long pending issue to streamline all the different types of indirect taxes and implement a “single taxation” system. This system is called as GST ( GST is the abbreviated form of Goods & Services Tax). The main expectation from this system is to abolish all indirect taxes and only GST would be levied. As the name suggests, the GST will be levied both on Goods and Services. GST was first introduced during 2007-08 budget session. On 17th December 2014, the current Union Cabinet ministry approved the proposal for introduction GST Constitutional Amendment Bill. On 19th of December 2014, the bill was presented on GST in Loksabha. The Bill will be tabled and taken up for discussion during the coming Budget session. The current central government is very determined to implement GST Constitutional Amendment Bill. GST is a tax that we need to pay on supply of goods & services. Any person, who is providing or supplying goods and services is liable to charge GST. GST is collected on value-added goods and services at each stage of sale or purchase in the supply chain. GST paid on the procurement of goods and services can be set off against that payable on the supply of goods or services.The manufacturer or wholesaler or retailer will pay the applicable GST rate but will claim back through tax credit mechanism. But being the last person in the supply chain, the end consumer has to bear this tax and so, in many respects, GST is like a last-point retail tax. GST is going to be collected at point of Sale. The GST is an indirect tax which means that the tax is passed on till the last stage wherein it is the customer of the goods and services who bears the tax. This is the case even today for all indirect taxes but the difference under the GST is that with streamlining of the multiple taxes the final cost to the customer will come out to be lower on the elimination of double charging in the system. The current tax structure does not allow a business person to take tax credits. There are lot of chances that double taxation takes place at every step of supply chain. This may set to change with the implementation of GST. The current taxes like Excise duties, service tax, custom duty etc will be merged under CGST. The taxes like sales tax, entertainment tax, VAT and other state taxes will be included in SGST. What is the applicable GST rate? The rate (percentage) of GST is not yet decided. As mentioned in the above table, there might be CGST, SGST and Integrated GST rates. It is also widely believed that there will be 2 or 3 rates based on the importance of goods. Like, the rates can be lower for essential goods and could be high for precious/luxury items. To implement the bill (if cleared by the Parliament) there has to be lot changes at administration level, Information Technology integration has to happen, sound IT infrastructure is needed, the state governments has to be compensated for the loss of revenues (if any) and many more.. Since GST replaces many cascading taxes, the common man may benefit after implementing it. But it all depends on ‘what rate the GST is going to be fixed at?’ Also, Small Traders (based on Annual Business turnover) may be exempted from it. France was the first country to introduce this system in 1954. Nearly 140 countries are following this tax system. GST could be the next biggest tax reform in India. This reform could be a continuing process until it is fully evolved. We need to wait few more months for more details on Goods & Services Tax system. Latest update (06-Apr-2017) : Rajyasabha passes GST bill. Now, the state assemblies would consider and pass their respective State GST (SGST) law. Latest news on GST (30-Mar-2017) : GST Bill has been passed in Loksabha. Latest update on GST Bill implementation date (28-Feb-2017) : All States now agree to roll out GST by July 2017. Zero Tax rate : There won’t be any tax on almost 50 % of items in the Consumer Price Index basket, including grains used by the common man. 5% Tax slab : This is applicable on items of mass consumption used by common people. There would be two standard rates of 12% and 18% under the GST regime. All the items (especially luxury items) which are now taxed at around 30% will fall under 28% GST rate slab. An additional cess would also be levied on luxury cars, tobacco products & aerated drinks besides the highest tax rate (28%). The tax rate proposal will now be placed in Parliament for its approval. Latest News on GST Bill (08-Sep-2016) – GST Bill gets President’s (Shri Pranab Mukherjee) nod. The enactment of the bill will now pave the way for the setting up of the GST council. Latest News on GST Bill 2016 (03-August-2016) – Rajya Sabha passes GST Bill. What next? – The passage of the GST constitutional bill will lead to the setup of the GST council. The council will then deliberate upon the exact GST rate, which will be ratified by the States. The final and actual GST Bill will likely be taken up in Winter Session of the Parliament. Latest news (14-June-2016) : Ministry of Finance releases Draft GST Bill. Click here to download GST Draft Bill 2016 PDF. Latest News (24-Apr-2015) : Finance Minister, Arun Jaitely has tabled the GST Bill in Lok Sabha. Do you think GST Bill is going to be the game changer for Indian economy? Do share your views and thoughts. What is GSTIN? How to identify it in your Bills / Receipts? How to Register for GSTIN online? How to migrate online? Fake GST Bills? | How to verify GSTIN number & GST Slab Rates of Goods & Services? Very nicely explained, thank you sir. nice article as GST Bill will be very useful for country because the people in our country need to pay many indirect taxes as a result things become very confusing for them as well.but this bill will have a simple tax structure a it will affect the prices of goods and services in the country.Can you tell me how GST bill will affect banking sector ? I would like to know that below 20 Lakh turnover Shop or business not cover & upto 50 L no paper need. If I purchase goods of Rs 100 from above ref shop. If he did not give bill as ( Tendency to evade from tax) how he will catch in the system for tax of last stage of product. One day or the other day they may get caught as, there is a Cash transaction limit of Rs 2Lakh and above and 100% penalty.. If I buy an apartment after GST implementation, how much percentage of tax should I need pay? will there be an increase/decrease in the tax? Dear Lawrence..Kindly go through this article.. Thank you, Sreekanth.. it’s really useful..
GST will be applied also to import goods? Imagine, I want sell product from Portugal to India. This GST can be applied also? Many thanks and very best regards. Dear Pedro.. As per GST Act, both SGST and CGST can be charged under import in India. I love the language you use for explaining. Too much user friendly. I really like it. And kindly update the post. GST bill has passed in Lok Sabha. In the above exapme given by you, in 3rd category, if 8% gst paid on Rs.500, Gst Rs.40. Then if it takes credit of Rs.12 , then Gst collected there will be Rs.28 instead of Rs.20 written. 1. How manufacturing states would be benefited in tax collection as GST is levied at the last point? 2. How traders of auto parts, kirana shops, cloth merchants, food products etc can be brought into tax net by GST as they virtually do not pay any tax on their business transactions? That’s the reason why some States have been opposing implementation of GST bill. The Center is planning to compensate the States for loss of income (if any). Even if it doesn’t have a substantial shift for everyone, but this tax reform is a must. Bcoz it would surely curtail cumbersome processes and documentation in dealing with multiple taxes. even many states have own additional taxes like Octroi in Maharashtra which would be hurdled out too and make businesses smooth. 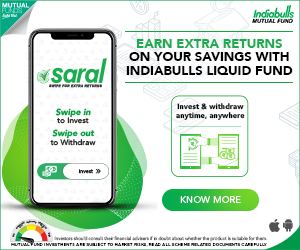 Only fear is we, smart Indians should not find a way out – with our Universally Unique quality called ‘JUGAD’ – to evade paying this tax too and make this move a flop. What do you say, Mr. Reddy?? Let’s hope ‘Tax evasion’ to come down, given the fact what’s happening now in the economy (Govt’s will to implement reforms..). Currently Service Tax is 15% which was hiked from 12.36%. Now there is another devil called GST which will replace ST at 18%+ for service industry. This is not justice done with service sector. Many businesses may pull out of India due to dictatorial move by gov & domestic businesses may die because crunching margins. Dear monika ..It is lke claiming Refund to offset the tax liability. I like the article but tell me how it help the consumer or final buyer with the cost effectiveness. He has to bear all the taxes of all the middle people who plays role in between. it made simple to pay taxes in single window. but there is no difference in the amount for the final user. Dear Sagar..It depends on the tax structure and the type of goods a common man use/consume. As per the latest proposed GST tax structure , most the essential commodities will have either zero or 5% tax slab rate. But let’s wait for few more months to have complete idea on this! My concern was exactly the same. Ultimately, the end consumer will die of burden for middlemen’s paid taxes as well as the taxes on their profits, which only consumers have to pay for……. Very good article to know About GST . Thank you very much REDDY SIR. Please give your valuable advise If we are purchasing goods(medicines) Under F.Form We cannot Resell them as Free Deals ( Bonus offer ) that according to Assessing Authority is violation of CST Act All such Free deals/Bonus are to be Received as free from the supplying dealer . Dear TAPOSH ..I do not have the required expertise on GST. Kindly consult a CA. I just want to know that, qutt. of Freedeals(Bonus) include in Form-F or not,please advise. I am small manufacturer of Modern Rice Mill Machinery, its spare parts and components, my maximum business interstate, if GST comes will the Govt. abolish C form? suppose unregistered buyers how to sale my product? I need separate commodity code for Rice Mill Machinery and its spare parts , do not put us under common category under “Machinery” , the State Govt. and Central Govt. must allot separate category and Tax percentage for “Rice Mill Machinery and its spare parts and its components”, so that it is easier to file monthly returns. We are doing sales and Services business you can say trading business. I have question, GST will be start from 1st April but if we have old stock of spares etc. then how GST will be calculated. The old stock if sold after the GST implementation gets impacted as per the new GST rate. I believe that the Govt might give some time to the business houses to clear up the stock, before implementing the GST. good article . lot of knowledge gained. Good article in simple language. Overall CAS practice will shrink! dekho agar GST bill lagu hota he to ye overall sab ke liye benifit hoga. basicaly end customer ko haga. GST se tax rate ek single rate ho jayega. ish ka ye matlap nehi ki , hamko tax caluclation nehi karna padega. har business sector ko jarurat hoga ek accountant ki for calculation of tax and other financial activities. fikar mat karo , Gst kisivi taraka luksan nehi dega hamari accounting association ko. or rahi bat clients ki. clients vi ayege par jo tax compute ke liye srif ate the ow saye de reduce ho sakta he. par overall it is benifited for accounting departments. Currently a trader who is having a sales turnover of say Rs 70 lakhs and service income of Rs 7 lakhs does not pay any service tax. Pl clarify if under GST how this service income will be treated? Whether it will be taxed on not? Dear Prasad ..As of now, I do not have answer to your question. You may kindly check with a CA. after implement GST bill, a PAN number impose on every trader under tax department, becz the tax under GST levied and collected through online. no one can retain tax liability. after GST, such trader also pay GST tax on services of RS 7la to govt. Everybody discuss regarding advantage of GST…. Is there any disadvantage. yes, there have some disadvantages of GST bill. Thank you so much dear sushanta for sharing your views..Keep visiting! I am namkeen manufacturer. Doing business in Mumbai it self. Its small Gruha Udyog. GST is beneficial to us. because earlier we are not fall in vat category because our sale is less than Rs. 500000/-. SIR JI, MAIN JANNA CHAHATA HOON KI GST LAGOO HONE KE BAAD BHI, RETAILOR KO ABHI KI TARAH VAT RETURN FILE QUATERLY SUBMIT KARNA PAREGA KYA? Dear JAWAHAR ..VAT will be replaced. Good Information! will see if common man gets benefit. 1. what GST tax components(I.e CGST, SGST , IGST) will comec for bank charge service tax , travel service tax , insurance premium service tax and etc . 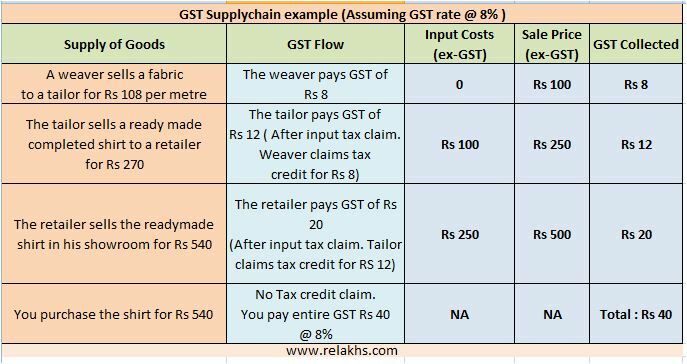 Thus, the total GST on the entire value chain from the raw material/input suppliers (who can claim no tax credit since they haven’t purchased anything themselves) through the manufacturer, wholesaler and retailer is, Rs 10 + 3 +2 + 1, or Rs 16. How it would be in a non-GST regime? In a full non-GST system, there is a cascading burden of “tax on tax”, as there are no set-offs for taxes paid on inputs or on previous purchases. Thus, if we consider the same example as above, the manufacturer buys raw materials/inputs at Rs 100 after paying tax of Rs 10. The gross value of the shirt (good) he manufacturers would be Rs 130, on which he pays a tax of Rs 13. But since there is no set-off against the Rs 10 he has already paid as tax on raw materials/inputs, the good is sold to the wholesaler at Rs 143 (130 + 13). With the wholesaler adding value of Rs 20, the gross value of the good sold by him is, then, Rs 163. On this, the tax of Rs 16.30 (at 10%) takes the sale value of the good to Rs 179.30. The wholesaler, again, cannot set off the tax on the sale of his good against the tax paid on his purchase from the manufacturer. The retailer, thus, buys the good at Rs 179.30, and sells it at a gross value of Rs 208.23, which includes his value addition of Rs 10 and a tax of Rs 18.93 (at 10% of Rs 179.30). Again, there is no mechanism for setting off the tax on the retailer’s sale against the tax paid on his previous purchase. The total tax on the chain from the raw material/input suppliers to the final retailer in this full no-GST regime will, thus, work out to Rs 10 + 13 + 16.30 + 18.93 = Rs 58.23. For the final consumer, the price of the good would then be Rs 150 + 58.23 = Rs 208.23. Compare this Rs 208.23 — with a tax of Rs 58.23 — to the final price of Rs 166, which includes a total tax of Rs 16, under GST. 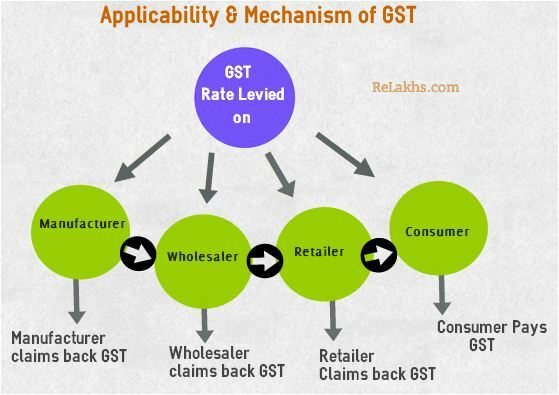 Thank you for explaining the GST mechanism in a detailed way. The key point is ‘GST tax Rate’ here. Also, some for some sectors it can have a negative impact. But overall, it is a positive factor for our economy in long-run. And a much needed tax reform. In your example let us say weaver is Mumbai. Retailer and customer are in Kolkata. 1) Will weaver get tax credit from Mumbai state government ? 2) Will the GST paid by customer Kolkata state government revenue? 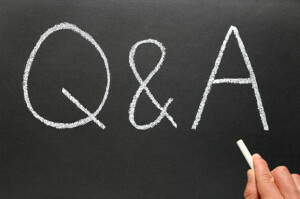 If answer to the above questions are yes, then will producer state loose revenue and consumer states will gain revenues? That’s the reason why Centre is proposing to provide financial assistance to the States for loss of revenue for the next 5 years or so. This is one of the main reasons why some State Govts are opposing the GST bill. Since stock market is down from last 5 days so Sreekanth, do you think its nice time to do the lumpsum investment, considering GST will have positive impact on economy in long term. GST can be considered as a major tax reform but the benefits may be seen over a long run. Also, kindly do not try to time the market based on just one or two events. Nice article… I have one doubt. Basic custom duty include in Gst. Please advise us. Thanks in advance..
Dear Sridharan.. I believe that ‘Customs Duty’ is not going to be replaced by GST. please let us know in exemted area like Himachal pradesh, shikim, Assam is GST aplicable? Dear Biswajit .. Yes it will be applicable . This article was very simple to understand as well as informative. I am a post graduate student in commerce & i am currently looking for a dissertation topic. Do you think GST is a researchable topic ? I believe that Prices of completed apartments/properties will not be affected as GST will not be applicable on completed immovable properties. However, prices of under-construction properties might get affected (increase) once the GST rolls out, but this again depends on the exact gst tax rate. Let’s wait for few more months to get more clarity. DEAR SIR, PLZ GIVE ME FULL GST BILL ACT IN HINDI LANGUAGE.ON MY EMAIL ID. Dear VIKRANT ..As of now, I do not have the bill in hindi..
Can you please explain it to me by giving an example, which compares the current Tax value and the Tax value after GST? Let’s say I had a Mc Aloo Tikki Meal for ₹100 at McDonalds. So, what is the tax that I am paying today and what will be the tax that I will pay after GST is implemented. I am a starter in this. Plus, the tax value will decide whether people will support it or not..
And please keep writing such nice articles. If we assume 17% as the GST tax rate, then the tax amount would be Rs 17 for the given example. Let’s take the current scenario : I had an ice cream in Ibaco. They have charged me VAT @ 14.5% and Service Tax @ 5.6%. So, the total taxes is more than the assumed GST rate. There are lot of confusions in this bill.While a single tax structure is good as it simplifies the system and corruption will also reduce but it will not benefit the end user. For example, if I go to cinema theater to watch a movie then I should be paying only entertainment tax, why I should pay VAT as no value is added when the movie comes to a theater, why I should pay service tax as no service is provided at the theaters,why I should pay all goods related taxes as their are no goods involved here. With GST I am paying all these extra charges. At the cloth store why I should pay entertainment tax? I think GST has lot of flaws. The best solution is to separate goods and services taxes and abolish VAT altogether. This way the end user will be taxed only for either the goods or services and not both.VAT is being abolished all over the world and it should be abolished in India too as it encourages lot of corruption. Dear Manohar..Thank you for sharing your views. It also depends on the rate of tax. It may balance it out?? but i am of the opinion that the common man defiantly suffer in because of GST. Dear Nikhil..May I know why do you think so? Kindly share your views. Am Senior Citizen like so many others who have only Rental Income EXCEEDING 10 LACS attracting Service Tax Liability. As ONLY SERVICES are involved, therefore, in such cases is GOVT. considering SEPARATE SERVICES TAX SLAB being GST is NOT APPLICABLE. Dear MR MALHOTRA..I am not sure about this and let’s wait for some more time to have a clarity on this. Nice article. The GST Bill will be passed certainly. As you said just it is a political game to not to claim the credit by BJP. First the UPA Govt. only proposed the GST Bill. Finally they will combine to pass the bill. Any how that is different issue. But finally what I am feeling that only corporate people , manufactures, retailers and service providers only will get more benefits. what ever tax rate it may be (16%- 18%), One side , they are going to get back GST as input tax credit and they have the right to increase the selling price at any point of sale as they wish. Govt. mat collect taxes easily , and there is no doubt. But ultimately the end user or consumer will suffer a lot. It is dam sure that all thee goods and services prices will increase. And no one has right to stop the prices. So that the inflation increases. In most of scenarios, it is the middle-man who make lot of profits. The end-user is always at the receiving end. Let’s wait for more clarity on GST bill and also about the final tax rate. Dear Sreekanth, this is a very beautiful article. It is very well written in a manner that even a non-financial guy (like me) can understand. Keep up the great work. Will look forward to your other articles as I have bookmarked your page. 1. there has been nasty arguments in our parliament recently, with our political leaders not coming to an amicable resolution on passing the GST bill. What are the government’s next steps? Is there a government website where a common man (like us) can track the status of the GST bill progression? 2. I read in other articles that all business entities/associations in India filed for an online petition for passing GST bill through the CII website. However, to their vein, the GST bill still did not pass. What is the reason? If it is people’s wish to get the GST passed, then why didn’t it happen? Or is it that general people (outside of business entities) should also apply through a petition? Please share some knowledge. 3. You clearly mentioned that states are reluctant to GST because they might lose revenues. Clearly, what states don’t know (or probably don’t want to disclose) that less than 10% of people pay states taxes legally. Given the stupidity of so much tax levied, obviously any person would want to avoid ridiculous tax cascades, and they end up paying a bribe. In other words, as you rightly mentioned, the high corruption in india is a direct result for so many taxes, and GST, being an indirect tax, will also indirectly eliminate (or at least reduce) rampant corruption. My question therefore is, what resolution is the center providing to the states, to assure them of getting a better revenue if GST is enforced? Because clearly, more people would come out in the open to pay taxes legally, when it is a reasonable amount. Or as a citizen, we people like us propose a plan to the central/state govt. that will assure them of passing the GST bill. Because clearly, no developed country would have instilled the GST (like over 140 countries), without this having a greater benefit in the long run. Sorry to post such a large comment, however, thanks to your clearly explained article, I am thinking of setting up an online petition for GST by writing in a manner as to how it would benefit the common man. What are your thoughts? Or would you suggest that given the current central govt scenario, the GST will eventually get passed? Looking forward for your reply dear friend. Again, keep up the great writing work! I believe that implementation of GST is beneficial to our economy. There will be challenges or initial hicups after the implementation, but the benefits will be immense over the long-run. You & me, most of the business houses and the current govt would like to implement the GST bill ASAP. But the current opposition parties are stalling it due to political differences and nothing else. They may not like to pass on the credit of GST bill implementation to the current govt. The govt does not have clear majority in Rajyasabha though it has 2/3rd majority in Loksabha, this may be the situation till 2016. Hence, I believe that Bihar elections are key to the govt and its future plans to aggressively push the much needed economic reforms. Thank you Sreekanth, for the prompt reply! Praying for the bihar results. Just found your page on facebook. Look forward to check up on your page regularly. Again, keep up the great writing work. Wishing your more success. I am having small pvt ltd company dealing in computer parts & computers. Our main activity is trading of computer parts & assembly of computers . I have few queries regarding excise & gst. As our business is expanding we will shortly be exceeding the exemption limit for excise. In excise unit separate premise have to be maintained with various registers to be maintained to avail modvat credit. For small to medium manufacturer where trading activity is also involved it is difficult to maintain all the records. If GST is implemented will there be any change in record keeping for excise units. Can they combine trading & manufacturing activity under same place. Please advise regarding the same. Kindly consult a practicing Chartered Accountant. Dear Nagaraj..Thank you and keep visiting! Excellent presentation of the topic. Do you think which are the sectors that will benefit after the implementation of gst? Thank you! There are lot of players (companies) in different sectors who fall under unorganized category. Most of these companies will come under tax regime after the implementation of GST. This will lead to reduction in their competitiveness compared withe organized players. There is high percentage of unorganized players in certain sectors like Paints, Sanitaryware, Textiles, Batteries, FMCG, Footwear etc.. Hence companies which fall under these sectors can benefit.